The first quarter for credit unions tends to be a transaction-heavy time of year with tax returns and year-end work bonuses hitting members' accounts. The influx of cash via member deposits coupled with fresh advertising budgets sets the stage for credit unions to deepen member relationships and increase their wallet share by extending credit. But for a credit union to retain members and help them improve their financial well-being, it’s imperative for front-line staff to focus on those in front of them. However, it is difficult for tellers to uncover financial needs while expeditiously completing transactions. Especially during high-traffic hours, it's easy to miss an opportunity to have value-added conversations with members. Given the delicate balance of supply and demand for teller time, what IS the optimal member per full-time equivalent employee ratio (members/FTE) for a credit union? What is that ideal number that enables productive conversations that result in growing member relationships rather than missed opportunities? Callahan & Associates is currently reporting first quarter performance data on 5,725 credit unions representing 99.1% of the industry’s assets. In the first quarter, the average members/FTE ratio for all credit unions in the nation was 386. 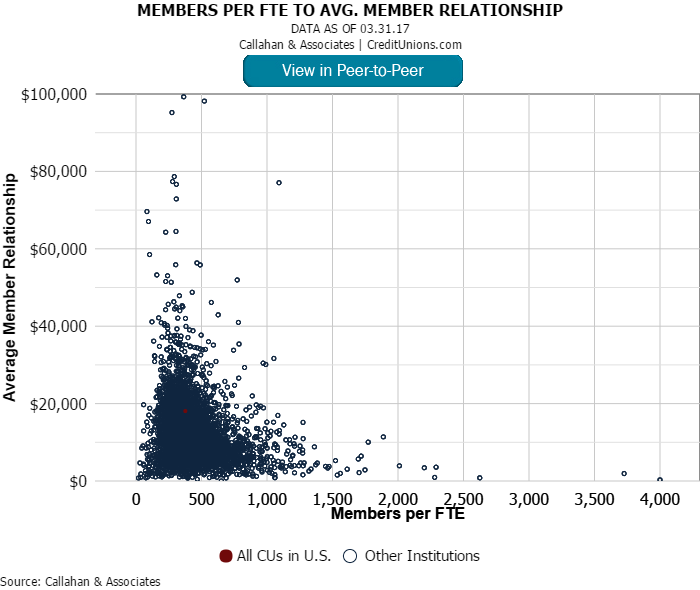 Despite the outliers, the scatterplot below shows how credit unions near that ratio tend to have a higher average member relationship than credit unions with higher members per FTE ratios. Thoughtful conversations allow staff members to address how a credit union's products and services can meet the financial needs of a member. 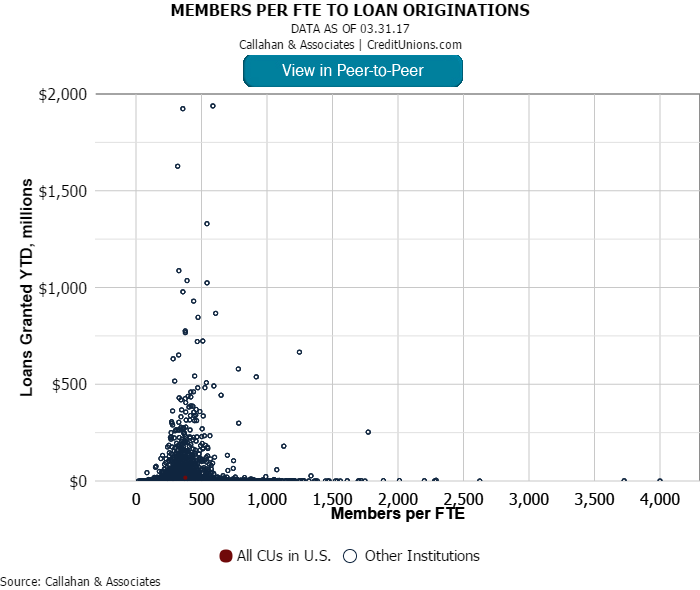 Credit unions with a members/FTE ratio between 250-550 members generally originate more loans and capture more deposits than those with a larger ratio. Similar to average member relationship, loan originations and average share balances decrease as there are more members per FTE to serve. As members increasingly leverage technology to conduct day-to-day financial transactions, the need to step into a brick-and-mortar branch is declining. However, there are still occasions wherein members need exceptional service face-to-face or over the phone. An optimized members/FTE ratio will help ensure credit unions can provide just that.